Stephen King says you should be able to finish the first draft of a book in 3 months. Still most writers take years to write their first book. It’s a colossal undertaking on your first go at it. 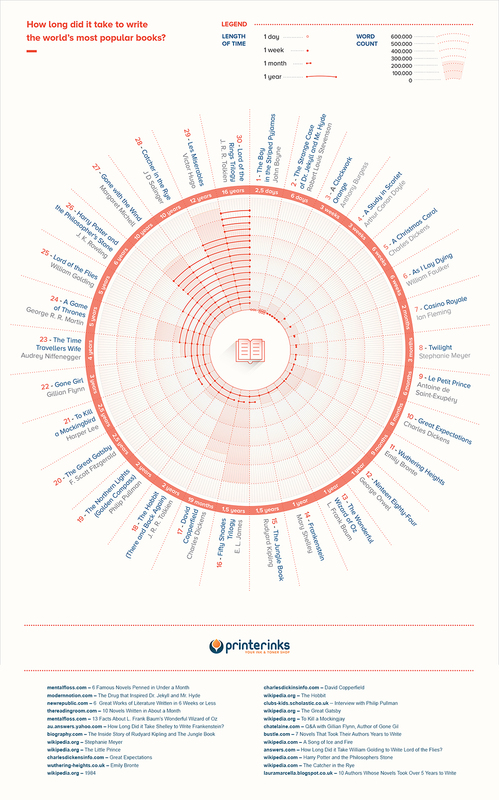 PrinterInks.com created the chart below to show how long it took for some of the famous works we all love took to write. I was surprised to see that A Clockwork Orange, one of my favorites only took 3 weeks. I think this chart is a great way of visualizing how little or how much time it could take to complete the task you have a hand. Some books I’m impressed by the quickness of their writing and others I’m shocked by the length of time it took to complete them. Like Catcher in the Rye. It took 10 years for J D Salinger to write that book. Personally, I aim for 1500 words a day. A book just about every 3 months. But I haven’t been able to hit that consistently lately. I have 2/3 books in a fantasy series I wrote over a year ago that I haven’t had the interest in editing, a western, and 2 dystopian scifi books that I haven’t edited either. When I wasn’t worried about trying to sell the books I wrote, I wrote a lot faster. I also planned the story-line a lot less. I’m trying to get back to that, and to get back to editing the books I wrote years ago. (I didn’t publish them because they were early works. Early works always felt too weak to share). Interesting statistics, but Stephen King is one of these anomalies along with his talents who can churn out books without even sweating. I wonder how long it took for his first book (if it ever got published) versus what he does now. Then you have James Patterson who has a series of ghostwriters that writes for him. My first manuscript took eighteen months, but it wasn’t anything I would publish. I then took parts of it and rewrote it into three books (the last one to be released in April or May). Each book took eight to 10 months to complete. I’m guessing, the more experience we have the easier it gets to write, but we take more time with editing our work. So it doesn’t shorten the process from start to finish. Thanks for good thought provoking post. Thanks. When you broke your book up did you make it into a series or 3 separate stories. I wrote 3 books before I published my first book. I like to view writing as art. You don’t draw good the first time you draw. you work at it. Just like with writing. My first book is fiction based on my experience. The second is a memoir as well as the third will be. I will add your books to my Kindle, a few at a time. I think an author like Stephen King, with so many stories in his head, finds it easier to just crank them out. I wonder, on the other hand, how long it took Tolstoy, to write even the relatively brief for him) Anna Karenina? I like networking with other writers and part of that always leads to discussing workflow/writing time. Most of the successful indie authors I have spoke with are cranking out books faster and faster year year because it seems to be the only way to keep up with the indie market and ensure they will have strong, consistent sales. I’d like to write a book a month, however, I’ve yet to do so effectively. Pingback: How Long Does It Take To Write A Book? — Richard Klu @thewritealice – thewritealice MLS – Let Us Write You The World In Our Eyes. I think setting timelines keeps you focused but i respect you differing viewpoint.